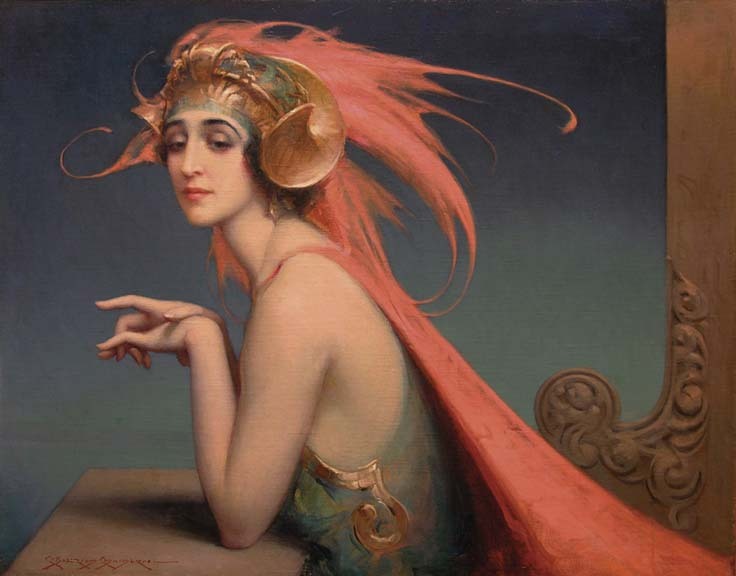 Charles Bosseron Chambers was known for figurative works in an illustrative manner, with many of them being either portraits or works with religious themes. An illustrator and teacher as well as painter, Chambers was born in St. Louis, Missouri on May 1882. His father, a young Irish captain in the British Army, was a convert to the Catholic Church, and his mother was the daughter of a French family long established in St. Louis. Charles, the youngest of several children, was sent to the Preparatory and Grammar Schools connected with St. Louis University in his earliest years, and his education in his chosen art was begun under Louis Schultz of the Berlin Royal Academy, with whom he spent six years. His next master was Aleis Hrdliczka of the Royal Academy of Vienna, and he later studied with Johannes Schumacher of Dresden for six years. After matriculating at St. Louis University, Chambers began his professional career at Palm Beach, Florida, a place chosen because of his mother's failing health. From this period in his artistic productions date the fantastic figure compositions exhibited at the St. Louis Exposition, together with portraits of Colonel Mitchell for the Missouri Historical Society; Joseph Jefferson, the great American actor; young Master Haven; Henry Phipps; Henry M. Flagler; Mrs. Voorhis and others. In 1916, he moved to New York City, and established himself in the Carnegie Studios, Carnegie Hall, where he occupied a splendid atelier. Here he produced the Light of the World, the most popular religious painting of the early 1900s in the USA. He was a member of the Society of Illustrators, established in 1901 in New York City, and the Salmagundi Club, an early important art club in New York City. He illustrated Sir Walter Scott's, Quentin Durward, in the Scribner Classics for Young People. His work was exhibited at the well-known John Levy Galleries in New York City in the 1930s, and his work is now in several public collections in St. Louis and Chicago, including Chicago's St. Ignatius's Church, Missouri Historical Society in St. Louis, and the Osceola Club in St. Augustine, Florida.